I came to yoga from 15 years of dance. I like thinking and feeling through my body. I like to see how subtly and precisely I can articulate my physical body. I am interested in the ramifications of that work on all levels of my being. I am more comfortable exploring non-verbal presence. I want to be an engaged, compassionate presence in the world. I’ve experienced periods of darkness and stagnancy. Yoga challenged me to take a clear look at myself and find a way to work with those aspects of myself. Yoga is satisfying because it provides a path for that work. It offers an attempt at codification for something that is not really possible name. It offers manners and methods to cultivate a strong presence or to live more gracefully. It is nice to have a roadmap for that kind of murky, personal, terrifying, exhilarating work. I think my practice off the mat exists most clearly in hard conversations and challenging situations. The sticky spots where I am not my best self, but have noticed it enough times to make a small shift. To be able to soften when I am triggered. To move from a place of tenderness for myself. To be able to own the fact that I have agency in every situation. Sense of humor is a big part of my practice—I tend to take myself far too seriously. The one-on-one therapeutic work I do with people in the community is also a part of my practice. I get a big thrill from helping folks rediscover their bodies or heal an injury, but my approach has to carefully balance everything I know with everything I don’t know. I like the familiarity and integrity of the lineage at Lila. The teachers tend to speak from real practice and experience. Lila feels like a Portland institution at this point. There is an accumulation of momentum in the space, and I like when it hums with bodies moving and working and paying attention. I am in the precarious, but interesting position of having a serious hip condition from a lifetime of dance and yoga. The poses and types of poses that trigger the problem feel a bit like enemies these days. In some cases, the answer is not to be doing more of them—certain things really are off limits right now and I am working to accept that. I am relearning other poses; relearning the actions that will keep my body safe; retraining groups of muscles for better integration and balance. I focus way, way more on strength and stability than flexibility. It is so interesting to come to a place where I do not want to get more flexible, in fact in some areas I am working to get tighter! It can be tedious, frustrating work, and sounds like a bummer, I know, but it’s good because I have to get really honest and ask tough questions. How to go deep with a more limited range of motion? What should yoga be, really? What is the point of pushing myself in a particular pose? How do I teach honestly about the fact of injuries? 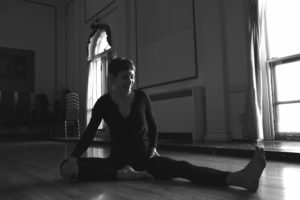 How do I keep finding ways to enjoy my practice and teach classes that are joyful, while keeping myself and my students safe? Good stuff.